Three years ago, my husband left his perfectly secure job (read: with benefits) and became a full-time consultant for his old company (read: without benefits) so we could have a much nicer lifestyle in Williamsburg, Va than we did in the small Pennsylvania town in which we’d lived for nine years (no offense to Pennsylvanians, but I’m a Virginia born-and-bred gal and I needed to get back to the Commonwealth, where the daffodils bloom in February and we can wear flip flops before June). Needless to say, we lost the benefits (read: employer-provided health insurance) that had allowed me to go out on my own as a freelance medical writer seven years before. No problem, I thought. I’m a healthcare expert. Heck, I once managed the provider relations department for a mid-sized managed care company, contracting with doctors and convincing them that they hated our HMO less than the other HMOs in the area (I was pretty darn good at it, too). I’ll just go out and find us some health insurance. I started on the individual market. For my sons and husband, who had never had a serious health problem, the premiums weren’t too bad: about $350 a month for all three. But for me–who had been diagnosed with clinical depression many years back and still took medication to control (note the word ‘control”) it–my premium for catastrophic coverage ONLY would be more than $900 a month. Luckily (and I say that with my tongue planted firmly in my cheek) I formed a corporation when we moved here. So we were able to find health insurance as a small business since we had two (i.e., my husband and I) employees. Oh joy! For a monthly premium of $675 we purchased two high-deductible policies, one for me and one kid; one for him and one kid. Note the words “high deductible.” With the exception of preventive care like regular checkups, immunizations, mammograms, etc., each of the two people on either plan had to meet individual deductibles of $2400 before either of us got first dollar coverage. Oh, and every January the deductible clock reset. In real terms it meant that barring some serious accident or illness that landed us in the hospital, we’d be paying out of pocket for all our medical expenses. That could be as much as $5800 for each policy, in addition to the $8100 a year we were paying in premiums. Oh, and don’t forget the 20 percent we’d owe even after meeting our deductibles. The benefit of this high-deductible plan? Our premiums were actually lower than if we’d chosen a plan with a lower deductible. And, of course, we could sock away several thousand dollars tax free to cover those out-of-pocket medical expenses–assuming, of course, that we had extra thousands of dollars just lying around collecting dust (doesn’t everyone?). There was one other “advantage” to this plan, however. After nearly 25 years of employer-paid health insurance, I’d actually get to see what things cost, something that few people with health insurance ever do. I mean, think about it. When you go to the doctor you pay a copay or, maybe, a small deductible. particularly when you pay for drugs. Like Alice, I was about to go through the rabbit hole. Only instead of the White Rabbit, Mad Hatter and Cheshire Cat, I was about to encounter–gasp!–the real cost of healthcare. I’ll never forget the first time I had my migraine medication refilled under the new plan. At the time, there were no generic medications and a single prescription came 8 pills to the pack. When the clerk at the pharmacy asked me, with real concern in her voice, if I knew how much the refill would cost, I thought she’d tell me $50 or so. I nearly fell to the ground. From then on, my husband and I had a pact; whoever went to the doctor always asked for samples of the medication. And every time I got a migraine, I actually considered whether the pain was bad enough to warrant the $35. I was actually lucky; my health insurer had negotiated the $280 cost with whatever middleman supplied the drugs to the pharmacy. Otherwise, my cost would have been higher. Same thing with doctor visits and tests. I saw this on every bill in which the provider posted the charges and then the “negotiated” rate. Sure I was out of pocket hundreds of dollars; but without that negotiated rate, courtesy of my health insurance, I would have been out of pocket thousands of dollars. The result? I thought about whether the healthcare service I was about to consumer was something I wanted (sure it would be nice to have the doctor confirm that my cough was the result of nasal drip but did I really want to spend the $45 for the office visit?) or need (I think I have strep and need antibiotics). All of which is a long-winded way of pointing out one extremely dsyfunctional part of our healthcare system: We, the consumers, don’t know what anything costs! Can you imagine driving up to a gas station for a gallon of gas and not knowing the price until after you pumped the gas? Even then, your cost would depend on what kind of car you drove. And, if it were a really nice car, you’d only have to pay a percentage of that cost. Everyone talks about the cost of healthcare; but most of those consuming it have no idea what anything costs, rarely have to pay the actual costs, and get most of the costs–including those of our health insurance–covered by others. Ergo, we demand every service we can get–cost be damned. Until the system can provide some transparency (and I’m thinking bar codes and price stickers on everything from a Pap smear to an emergency room visit) not to mention transitioning more of those costs to us, the patients, there is NO WAY we will be able to make even the tiniest dent in skyrocketing costs. 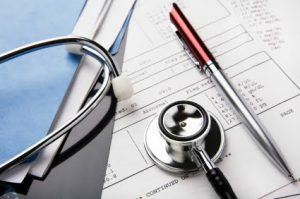 K. Wills Sterling–the cost of professional liability insurance can be quite high, but for lower-risk specialties, it is less than six figures. There are also states in which it is lower than other states. The greater cost, however, is not the cost of the premium itself, but the cost of defensive medicine. Almost all doctors end up ordering more tests than truly necessary because of the fear of lawyers. As for knowing the costs of things–I try to keep abreast of the general cost of pharmaceuticals. It is not possible to know exactly what it will cost a given patient, as it varies so much from insurance plan to plan, and with generics, from pharmacy to pharmacy. Where diagnostic tests are concerned, I am able to get decent cost information from freestanding radiology centers. Hospitals often will not give out that information, hiding behind the shield of saying, “It's proprietary.” It's very difficult to find out what the ultimate price will be of lab tests, imaging tests, or cardiac function testing performed through a hospital. As a physician, I find it frustrating when patients think the value of their visit with me is the cost of the copay. I fully agree that assuming more responsibility for the costs of care as well as the decisions of what care is necessary would make our health care system better. It's not just consumers who don't know the true cost of health care–neither do doctors. Years ago, when I either had no health insurance or very poor health insurance (I don't remember the details), I asked the doctor how much the medicine she was prescribing would cost. She had no idea. I was stunned. As you describe, the cost of a prescription is relevant information for anyone without health insurance or on a high-deductible plan. I realize doctors don't want to be bean counters and provide the most appropriate medical care, regardless of the cost, but to many of us, the cost of a prescription is important information, and we might want a less expensive alternative. And as a country, how can we possibly expect to get health care costs under control if neither doctors nor patients know the price of their care? Actually the high cost of insurance isn't really the root of the problem. Every doc in America has to pay a half million dollars, or more, per year as liability insurance to protect against lawsuits. Those dollars are passed on to consumers and insurance companies in the form of costs. We need tort reform. In states that have passed tort reform, both access to medical care AND costs have improved dramatically. Being able to buy insurance across state lines would also dramatically lower costs for consumers, particularly anyone in the northeast corridor, where the heavy hand of the nanny state has made the purchase of health care nigh impossible for the individual consumer. Thirdly, we need to reform the FDA drug approval process so that drugs can make it to market sooner, without millions of dollars being spent in useless studies – for instance, drugs that are beneficial to 90% of patients are refused access to the market; the FDA requires 95% success. That's idiotic. The approval process, if reformed, could greatly lower drug costs for patients as well as insurers, as well as provide an incentive for new drug development. For change to be beneficial, we need some wisdom in Washington, and we need meaningful dialogue and a thoughtful process. We don't have any of that. What they're trying to push down our throats is a senseless, moronic bill that will only increase costs for everyone involved in the healthcare process – patients AND doctors, as well as insurance companies. Change is needed, but the govt. needs to first implement the changes – see above – that will not cost anything to implement, before approving an idiotic entitlement program that will consume more than 20% of our GDP and add to the skyrocketing debt that we cannot support, even at current levels. I am a small business owner, too. If the govt. wants to create jobs, it needs to lower taxes. We have the highest business tax rate in the western world, thanks to Obama. There's a reason we're shedding jobs in favor of China and India. The current healthcare bill will do nothing to lower costs – in fact, higher costs to business, as well as consumers, are built into the bill. Make insurance more competitive, limit idiotic lawsuits, lower taxes. That will create jobs. Instead they keep adding to our debt. Remember that the govt. cannot provide $1 to you that it does not first take from someone else. The govt. does not produce anything. In fact, it is so sluggish and cost-ineffective that it normally has to take $2 or $3 from me in order to give you $1. There has never been a cost-effective program in the history of the U.S. govt. Deb, I thought this was wonderfully written, as always. It covered all the bases. As someone else with a high deductible, I would love some transpaency. Doctors, pharmacies and hospitals should have a price sheet. Is that too much to ask for? My doctor, at times, has recommended various tests and I've asked, “How much will that cost?” and that question is ALWAYS met with an “I don't know. No one asks that question.” Really? No one? The high cost of health insurance is what's destroying this country's economy. It's sad that the people who are fighting against change can't see that. As a small business owner, I know all too well that the high cost of insuring employees is the single biggest reason why companies are not hiring right now. You want to create jobs? Fix the healthcare system. And part of fixing the system lies in having reasonable discussions about what procedures and tests we all really need–and which ones we can do without. I think most people, if they had to pay out of pocket, would think twice about those MRIs for backpain. Are they really going to have the surgery to fix the problem? If not, why diagnose it in the first place? Actually, the tax-free accounts i refer to in the article are healthcare savings accounts. you still have to have the money to put into those accounts! But yes, we have the accounts set up. Luckily, my husband is now back in house with company and once again we have Cadillac, employer-provided health insurance. Have you looked into healthcare savings accounts? They are far cheaper, you keep all the money you put into it, and it rolls over from one year to the next. Several self-employed people I know are using this option and find it is quite reasonable, and actually cheaper, than buying conventional health insurance. What we need – and the govt. could do this at NO COST TO ANYONE – is (1) real tort reform (this would save every doc a half million dollars a year in liability insurance costs) and (2) the ability to buy insurance across state lines, which would encourage competitive pricing. Newer Making a List and Checking it Twice. . .